Objective: This in-vitro study evaluated the antibacterial efficacy of sonic and ultrasonic irrigation with either intermittent or continuous flush in root canals infected with Enterococcus faecalis. Method and Materials: Seventy single-rooted, extracted teeth with straight root canals were prepared with FlexMaster NiTi-instruments, sterilized, inoculated with E faecalis and incubated for 72 hours. Sixty roots were randomly divided into four experimental groups as well as into infection and sterile controls (n = 10 each). The remaining teeth were used for SEM analysis of smear layer removal (n = 5) and infection with E faecalis (n = 5). Irrigation in the experimental groups was performed with 1% NaOCl and syringe irrigation, sonic activation of the irrigant with EndoActivator, ultrasonic activation with intermittent flush, or ultrasonic activation with continuous flush. Microbial sampling was performed by collecting dentin shavings from the root canal walls. Colony-forming units were counted and statistical analysis was performed using nonparametric rank-based ANOVA-type tests for longitudinal data (P < .05). Results: A significant reduction of E faecalis of 3 log10 steps compared to the infection control was achieved by all irrigation techniques (P < .0001). There were no significant differences in antibacterial efficacy between syringe irrigation, sonically, or ultrasonically activated irrigation (P > .45). Conclusion: Activation of 1% NaOCl with either sonic or ultrasonic devices did not increase the antimicrobial efficacy against E faecalis compared to conventional syringe irrigation in straight root canals. Objective: In this prospective case series, the effects of flapless intentional replantation (IR) with root surface conditioning with enamel matrix derivative (EMD) was evaluated for the treatment of periodontally-endodontally involved hopeless teeth. Method and Materials: A total of 17 teeth (17 patients, aged 40 to 73) with ≥ 10 mm attachment loss and radiographic bone loss to the apex were included in the study. The affected teeth were atraumatically extracted using a flapless approach, then granulation tissues, calculus, and necrotic cementum on the root surfaces were removed. EMD was applied for 5 minutes to the root surfaces. The teeth were reinserted to the socket without any bone grafts and splinted. Results: After 2 years, clinical healing was uneventful in 16 cases and the radiographs revealed no root resorption or ankylosis. IR with EMD treatment provided statistically significant reduction in probing depth (6.4 ± 2.6 mm), gain in clinical attachment level (5.9 ± 2.5 mm), and gain in radiographic bone level (48.2 ± 26.1%) compared to baseline values (P < .01). Conclusion: Within the limitations of the study, flapless IR with EMD treatment appeared to act as an alternative strategy to extraction of severely compromised teeth with endodontic-periodontal lesions beyond the root apex. 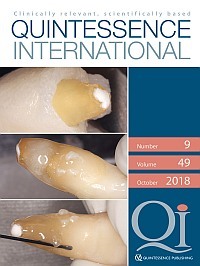 Objective: Many studies have investigated the effect of implant number on the performance of implant-supported overdentures (ISO), but few have focused on denture movement. This in-vitro study aims to investigate the influence of implant number on the movement of mandibular ISO under biting force. Method and Materials: An edentulous mandibular cast and 12 overdentures (n = 12) were fabricated, and a locator attachment system with blue nylon inserts was chosen for this study. Four implant positions were simulated: anterior midline (1-ISO), bilateral canine regions (2-ISO), anterior midline and bilateral molar regions (3-ISO), and bilateral canine and molar regions (4-ISO). After positioning an overdenture on one of these four casts, vertical loads were applied to the incisor region (40 N), the left canine (55 N), or molar (100 N) regions. The movements at the loading point and the right distal edge were measured. Significance across groups was analyzed using one-way analysis of variance and post hoc Tukey honest significant difference test. P < .05 was considered statistically significant. Results: On incisor loading, the 3-ISO showed the least movement, and no significant movement was detected across the other three groups. Upon canine loading, the largest displacement appeared in the 1-ISO group, at both the loading point and the right distal edge. Additionally, overdentures anchored by three or four implants, especially the 4-ISO, showed significantly smaller movement on molar loading. Conclusion: The implant number influences the movement of mandibular ISO, and overdentures retained with three or more implants have minimal movement. The purpose of this topic review is to give a general overview of gingival retraction agents used during prosthodontic treatment, and the possible difficulties connected to them that may be faced by the dentist. Hemostatic agents are important for successful gingival retraction and in achieving hemostasis. However, these agents may show numerous negative effects on the prosthodontic treatment and oral tissues of which the practicing dentist must be aware, and which will be elucidated in this review. PubMed and Google Scholar databases were searched for publications up to and including 2017. The following key words were used in different combinations: "hemostatic agent," "astringent," "astringency," "epinephrine," "ferric sulfate," "aluminum chloride," "hemorrhage control," "soft tissue," "hard dental tissue," "self-etch adhesive," "total-etch adhesive," "bond strength," "impression," "gypsum," "plaster cast," and "dental cast." In the last three decades the hemostatic agents used by practicing dentists have changed from epinephrine towards astringents, with AlCl3 and Fe2(SO4)3 now the most popular. All of the currently known hemostatic agents cause some local, temporary gingival tissue damage, but only epinephrine is known to elicit negative systemic effects. Studies concerning the influence of hemostatic agents on impression materials show highly contradictory results regarding the possible polymerization-inhibiting properties of hemostatic agents, probably due to the lack of standardization of methodology. Hemostatic agents seem to alter the dentinal surface properties making it more resistant to acid etching. Therefore the relatively low acidity of self-etch adhesives when compared to total-etch systems may not be strong enough to sufficiently etch a more resistant dentinal surface, and consequently may result in lower adhesive bond strengths. Objectives: An implant with an acid-etched fixture surface and internal-hex collar may achieve greater osseointegration. The goal of this research was to study the effects on long-term bone healing of fixture surface acid-etching and machined collar design. Method and Materials: Three two-part implant types were compared: standard Brånemark (with an external-hex 1.2 mm long machined flat collar), Swede-Vent (a copy of the Brånemark design, with an identical collar but a fixture surface acid-etched to 1 to 3 µm), and Screw-Vent (with a fixture surface acid-etched identically to that of Swede-Vent, but a longer internal-hex machined flat collar that did not require countersinking). Fifty-eight subjects each received the three types in alternate fashion at five sites between mental foramen, and a fixed full-arch prosthesis. Abutment-implant interface/microgap (MG) was placed at the crest, and first bone-to-implant contact point-to microgap (fBIC-MG) was measured at mesial and distal sides of each implant. Mean fBIC-MG values were compared after 15 to 20 years of function. Statistical analysis was based on the mixed linear model with the level of significance set at P < .05 and Bonferroni correction for pairwise comparisons. Results: Brånemark had less mean marginal bone loss (−1.08 mm, standard error [SE] 0.20) compared with Swede-Vent (−1.28 mm, SE 0.20), but pairwise comparisons showed that the difference was not statistically significant (mean difference of 0.20 mm, P = .662). Screw-Vent had the greatest loss (−1.92 mm, SE 0.20), and pairwise comparisons showed that the difference was statistically significant compared with Brånemark and Swede-Vent (difference ≥ 0.64 mm, P < .001). Conclusion: According to accepted standards for osseointegration, all three implant types achieved very acceptable long-term results. However, while Brånemark had the least bone loss, the implant with the acid-etched fixture surface and longer internal-hex collar design had the greatest loss. Within the confines of this study, shorter collar length of 1.2 mm may be more important to limit long-term bone loss with microgap placed at the crest. Objective: Surgical time prediction is an important factor to plan both clinical and organizational aspects of mandibular impacted third molar extraction. Many classifications have been proposed over the years, but their accuracy in surgical time prediction remained questionable. The present study introduced a modification of Juodzbalys and Daugela (JD) classification, and had the aim to validate its effectiveness in predicting the duration of the surgery. Method and Materials: Three centers treated patients needing impacted mandibular third molar extraction, following inclusion and exclusion criteria. Extractions were performed following a standardized approach, and surgical time was recorded. A blinded assessor assigned scores to each extracted tooth, according to original and modified JD classifications. Differences among the operators were evaluated though Kruskal-Wallis test, and backward multiple linear regressions were performed to evaluate the variables associated with surgical time, considered as the main outcome of the study. Results: 124 patients were treated with mandibular third molar extraction. Mean surgical time was 24.1 ± 22.2 minutes, with significant differences among the centers (P = .001). Surgical times among groups derived from both former and modified JD classifications were significantly different (P = .002 and P = .001, respectively). In the multivariate analysis, the statistical model including modified JD score was more efficient than the model with former JD score in predicting surgical time (R2 = .204 and R2 = .126, respectively). Conclusion: Modified JD classification resulted in a reliable tool for predicting surgical time of impacted mandibular third molar extraction; this could represent an adjunctive tool for clinician and patient in the decision-making process. The concept and application of a temporomandibular joint (TMJ) relationship identified as centric relation (CR) has changed significantly over the past century. Originally proposed as a biologically reasonable position where maxillary and mandibular dentures should occlude, it later was applied to the dentate population as well. The term "ideal" was used by the gnathologic dental community as they sought to define the exact details of CR in terms of condyle-fossa relationships. Assessments of patients' occlusion were then made in relation to CR, and discrepancies between the two positions were described as being problematic. Since not all dentists have accepted this concept, the clinical application of CR has become a topic of major dental confusion and controversy. To further complicate things, the formal definitions of CR have continuously changed over the past 40 years. In this paper, the biologic development of occlusal and TMJ relationships is reviewed, followed by a discussion about the validity of applying CR concepts and procedures in contemporary clinical and research settings. Special attention is devoted to the alleged relationships between occlusion, jaw positions, and temporomandibular disorders (TMDs). Current evidence suggests that it is time to stop applying CR concepts to the evaluation and dental treatment of healthy dentate individuals. For patients with TMDs, it is time to apply current concepts of biopsychosocial assessment and management rather than following the 20th century mechanistic models of fixing dental and skeletal malalignments. Objective: The gingival tissues surrounding the maxillary anterior teeth play a pivotal role in fostering a beautiful smile. The gingival zenith position (GZP) and its spatial orientation in the mesiodistal and apicocoronal direction can provide a valuable reference point. The present study was undertaken to evaluate the GZP and gingival zenith line (GZL) in maxillary anterior teeth in different age groups and genders. Method and Materials: The study population comprised 124 periodontally healthy patients equally divided into 21 to 40 years (Group I) and 41 to 60 years (Group II) age groups and gender distribution. The parameters of vertically bisected midline (VBM), GZP, and GZL were evaluated for all the teeth. Results: The GZP was distally placed in 54.68% and 78.12% of the central incisors for males and females in Group I, while in Group II it was 65.62% and 75.00% respectively. The majority of lateral incisors and canines had coincidence of the GZP and VBM. The GZL was found to be at an apical position with reference to the GZP of lateral incisors. Conclusion: A distal deviation of GZP was observed for central incisors, while the GZP coincided with the VBM for lateral incisors and canines. The GZL was apically placed in relation to the GZP of lateral incisors. These elements can be taken up as reference points in periodontal and restorative procedures.